The D.M. 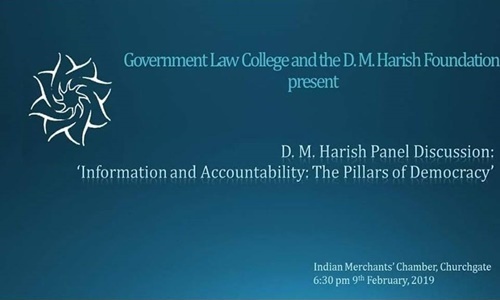 Harish Foundation, in association with the Mooting Committee of Government Law College, Mumbai is organizing the 20th D.M. Harish Memorial Government Law College International Moot Court Competition, 2019. The competition, which is currently in its 20th edition, is organized in the memory of the late Mr. D.M. Harish, one of the most accomplished and respected individuals in the legal fraternity. Every year, a panel discussion is also organized as a part of the moot. The topic for panel discussion-2019 is 'Information and Accountability: The Pillars of Democracy'. The final round will be held on 10th February at K.C. College Auditorium at 5:30 PM and will be presided over by Hon'ble Mr. Justice Akil Kureshi, Hon'ble Mr. Justice K.R. Shriram and Hon'ble Mr. Justice B.P. Colabawalla.